in 10dc = 4"; 2 rows = 1 1/4"
This is a pattern contribution to Cre8tion Crochet, and designed by Same DiNamics Crochet. The St. Croix Beach Wrap and color is inspired by the beaches of the tiny yet beautiful island of St. Croix, my home. The waters are clear and warm with a turquoise hue that just invites you for a swim. This wrap, though inspired by the sea, is not just to be worn at the beach. You can wear it lakeside, poolside or even while walking the boardwalk on any given day. 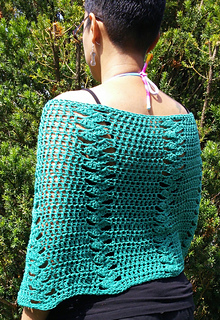 The St. Croix Beach Wrap has stitches that resemble stacked shells. You can make this wrap any length and color that you’d like making it uniquely yours. 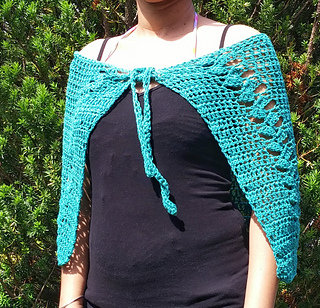 This wrap can also be worn as a shawl for when the sun is setting and the night is getting cooler.